I first read The Hobbit in the summer of 1978. As a fairly sensitive ten year old kid growing up in rainy, war-torn, depressing Belfast The Hobbit and Tolkien's universe offered me an enchanted, exciting alternative universe to escape to far from the everyday world of bombs and guns. Tolkien's land was self consciously rural, a pre industrial mythological Europe peopled with magical races and artifacts. 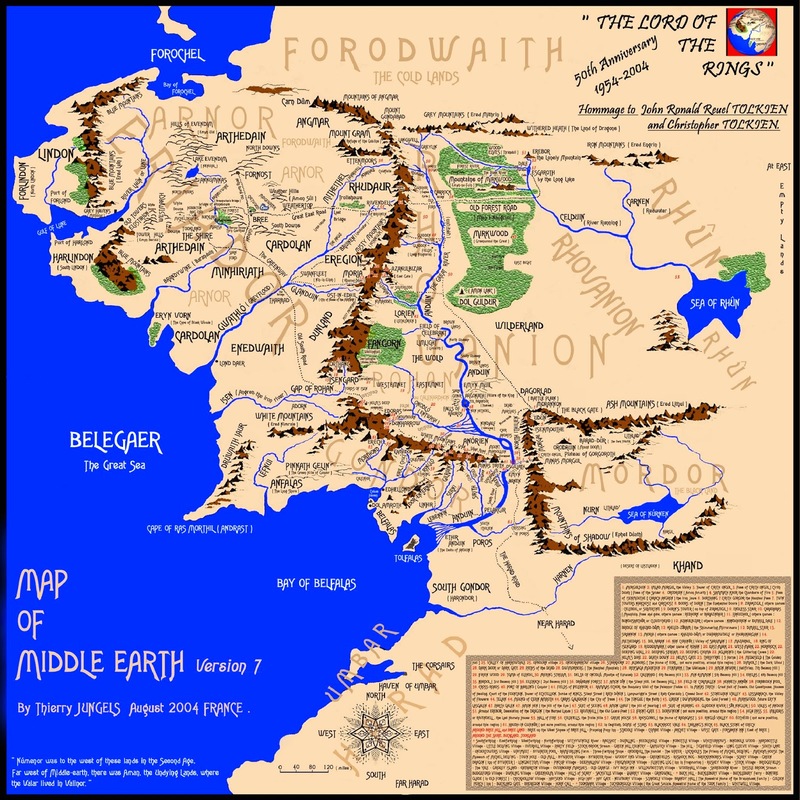 I loved the map at the beginning of The Hobbit and the even bigger map at the beginning of The Lord of the Rings. I liked imagining myself exploring the far flung places of Middle Earth that no one ever talked about: The Sea of Rhun, Far Harad, The Mouths of the Anduin... Later when I played MERP (Middle Earth Role Playing) I set campaigns in these places and had my characters explore The Iron Mountains or The Bay or Forochel. I grew out of Lord of the Rings of course, mainly I think because of its sexlessness, its lack of humour and especially its treatment of the bad guys. The orcs and goblins are sentient creatures who undoubtedly feel fear and pain but as readers we aren't allowed to think about that and we are supposed to rejoice in their deaths (Gimli and Legolas make a game out of killing Orcs). We never find out what the orcs and actually goblins want. What are their goals and dreams? What would an orc victory over Middle Earth look like? Their minds are no doubt swamped by Sauron's power but are there no orcs out there who are capable of resisting, who are capable of having ambitions of their own? Despite what Peter Jackson would have you believe orcs reproduce sexually and have children and for those children to be reared at all they must be loved. And if orcs are capable of love surely it makes slaughtering them with such gay abandon a bit more problematical, no? When I GM'ed MERP campaigns (that took place after the War of the Ring) I had my characters encounter Orcs who had become farmers* and traders (this was not as boring as it sounds) who could be reasoned with not just killed. After Tolkien I moved onto Ursula Le Guin, David Eddings, Raymond Feist and other fantasy writers and eventually gave up on the genre completely. I came to believe as Edmund Wilson famously said that Tolkien viewed "the whole drama of life as a showdown between Good People and Goblins.” In another famous essay Michael Moorcock called Tolkien's mythos nothing more than Epic Pooh. (I've written about some of these critiques in The Guardian, here.) As the years went by I grew less fond of Middle Earth but I still visited Tolkien's grave when I moved to Oxford and I made The Eagle and Child my local. And I admit that when I heard that Peter Jackson was making a movie out of Lord of the Rings much of my old excitement was rekindled. I enjoyed The Fellowship of the Ring and The Two Towers and only began to get weary of the whole project during the bombastic and interminable endings (plural) of The Return of the King (the worst of the 3 films). On Boxing Day 2014 I finally saw the last film in Peter Jackson's Hobbit trilogy and now I have some sense of closure. The decision to squeeze as much money out of the fans as possible by making this into 3 films was inexcusable. The Hobbit was by far the most filmable and accessible of the Tolkien stories but greed turned what could have been a solid 2 and a half hour movie into a 9 hour trilogy (the special edition will be 10 hours long), filmed inexplicably at 48fps and in 3 D. The Battle of the Five Armies was long and only intermittently interesting. By stuffing every frame with Lucas-esque CGI, by inventing pointless additional characters by turning The Hobbit into 3 heavy handed clunky films Jackson has finally worn down the last goodwill of this Tolkien fan. I'm glad it's all over. The kid in 1978 would have been so excited to see The Hobbit, the adult in 2014 is now thoroughly fed up with Peter Jackson's versions of Tolkien's books and hopes sincerely that they don't ever make any more. *I've always wondered what the orcs and goblins in The Hobbit actually eat. There are tens of thousands of them living underground in Moria and the Misty Mountains and there are no plants or large game animals underground. You could sustain a much smaller population by raiding, hunting and foraging on the surface, but how all those thousands of orcs and goblins feed themselves without agriculture is a mystery.